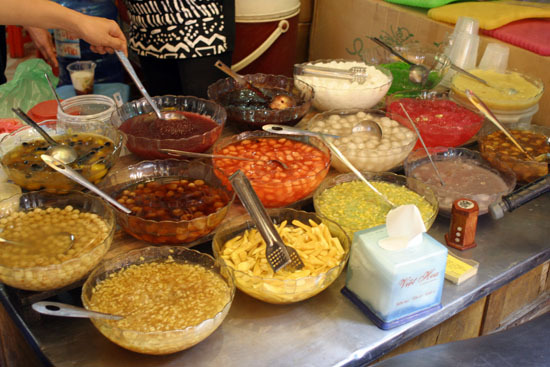 So you’ve read our post on what to do in two days on a budget in Hanoi, but what are you going to eat? Here’s our rundown of some of the dishes and places we reckon it’s worth squeezing in. Starting with breakfast, if it’s not included at your hotel, or you can stretch to eating out anyway, seek out a street vendor to try some banh my trung (egg roll) or xoi (sticky rice) – you’ll find it wrapped in small parcels in banana leaf. The former will cost around 12,000 VND and the xoi around 10,000 VND so they’re cheaper options than pho — which usually comes in at 35,000 to 40,000 VND. We would, however, highly recommend fitting a bowl of pho in sometime over the two days — it’s a Hanoi must-eat. For lunch, try Ngo Hang Chieu, near Dong Xuan market, if you’re in the area as it comes to life at lunchtime. 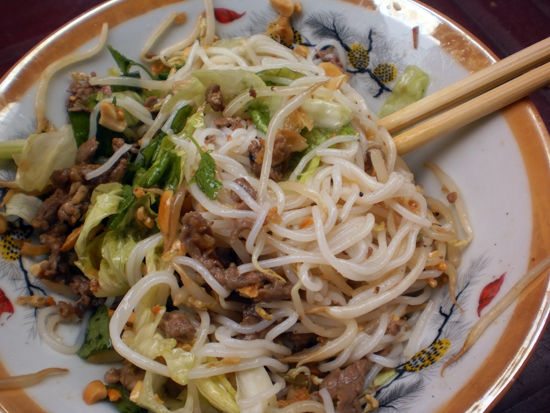 We like the pho tieu and the bun cha, another must eat. 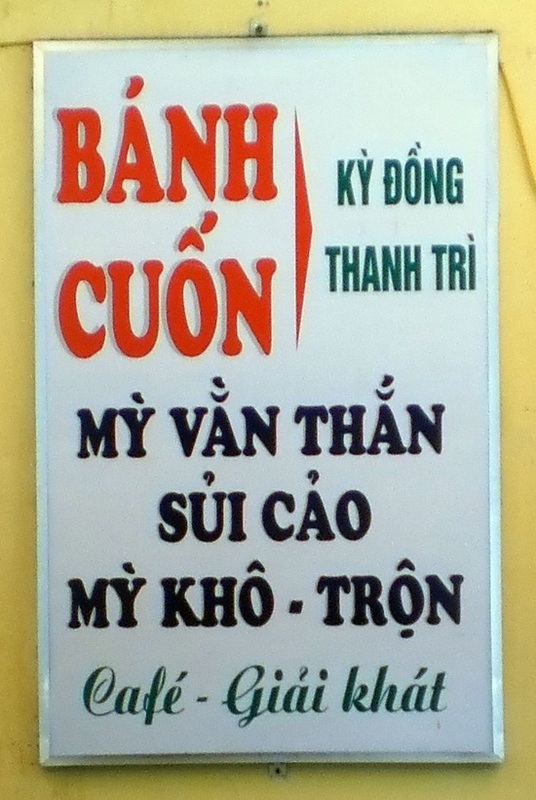 Likewise, check out Ngo Trang Tien, where we recommend mien tron, or Tung Duy Tan, food street itself. Tung Duy Tan is is also popular in the evenings — try the place at the junction of Tong Duy Tan and Cam Chi for banh cuon or share some good value Hue dishes at Net Hue. If you’re over near the cathedral, Ly Quoc Su has some good indoor lunch spots, including Pho 10 Ly Quoc Su and Noodle and Roll. In the evening, on a slightly bigger budget but still under $5, we’d share plates with a friend at a bia hoi joint, then check out 47 Ma May for grilled beef or indulge in bo bittet at Hang Buom. You’ve also got to drink. 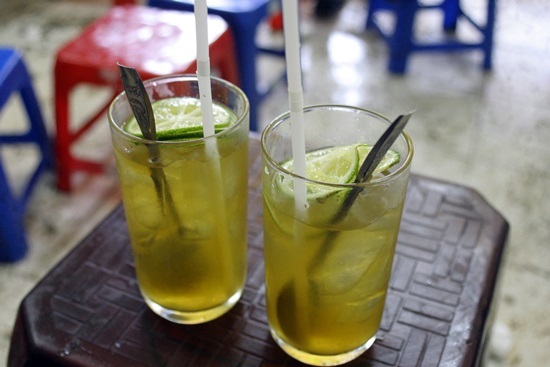 Worth trying during even the briefest stay are iced lemon tea, vietnamese coffee – iced or hot – and beer, either the bia hoi or bottled version. Be sure to take in the view from a well located bar or cafe — Café Pho Co is a good spot. The sweet toothed should give che a try or if you’re more a fan of savoury, how about a banh my kebab for something more substantial? The options are endless — check out our full food listings or read our street food tour reviews for still more ideas. 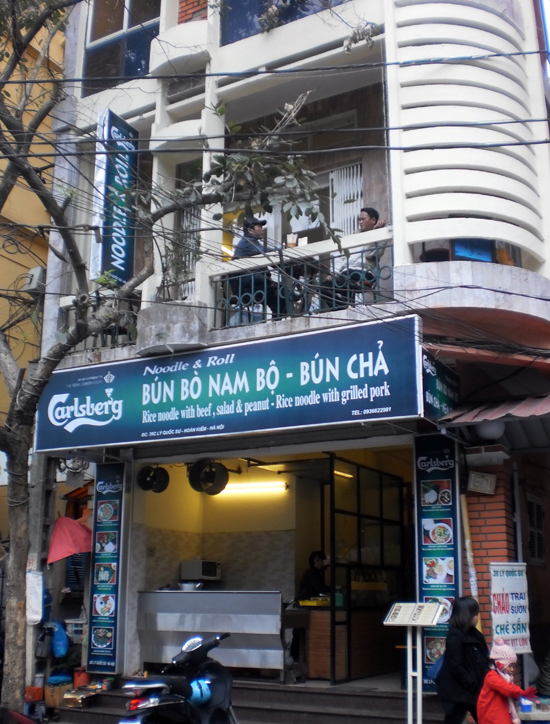 This entry was posted in Blog and tagged banh mi kebab, bed and breakfast, best hostel hanoi, best hotel hanoi, best hotel vietnam, bia hoi, budget hostel hanoi, budget tour, cheap hostel hanoi, dorm, food hanoi, hanoi hotel, hanoi youth hostel, ice lemon tea, local bar, pho, stcky rice, street food hanoi, street food tour, vietnam backpackers hostel, vietnam budget hostel, vietnamese coffee, xoi.